Mopra is a 22 metre radio telescope located at the foot of the Warrambungles, outside of Coonabarabran in Northern New South Wales. It’s about a nine hour drive from Sydney, and it’s hidden away behind a chain link fence (both for your and its protection). There’s no visitor’s centre, and it’s not terribly well signposted, all of which are used to justify how I’ve come to work with it for two years without actually seeing the telescope in person. It turns out that in the last many years the CSIRO (the Commonwealth Scientific and Industrial Research Organisation) has spent a lot of time and effort making sure that their telescopes (primarily Mopra, but also Parkes and the ATCA) can be operated remotely. Which is awesome, because there’s nothing quite like waking up in the middle of the night and logging in from your bed to check on the overnight observer. But it also means that newer observers have a lot less practical understanding of how the telescope works. These days we have engineers who know how to make it work… Well, it’s a bit more complicated than that. We use Mopra to look at the cold molecules in space: CO, H2O, SiO, CS and a whole host of others. These molecules show us where stars are just starting to form, in cold, dark clouds where the density is high enough that with a little bit of turbulence and some magnetic fields, self-gravitating cores form. Over time, these cores accrete enough mass that gravity takes over their evolution and they collapse to form a star. Generally speaking, Mopra doesn’t have the resolution to clearly make out the finer details of individual collapsing cores (for that you need an array of telescopes like ALMA), but Mopra is just the right size for doing large surveys of our Milky Way galaxy, and it’s the only telescope that can do such surveys in the Southern hemisphere (using ALMA to cover a similar amount of sky would take many hundreds of years, and smaller telescopes don’t have such nice resolution). The Mopra Southern Galactic Plane CO Survey (Mopra CO for short, or MopraCo if you like to pretend you’re doing mad science) aims to produce maps of much of our galaxy in carbon monoxide, which is the second most abundant molecule (the most abundant, molecular hydrogen, doesn’t radiate at the low temperatures found in molecular clouds, so we can’t actually see it). Our maps will be at least an order of magnitude better than previous surveys (that’s 10 times more pixels in every dimension, and we are able to make 3D maps, though there are tricks to this that I’ll go over in another post). With these maps, we will be able to figure out just how much molecular gas is in the delta quadrant of our galaxy, and where it is, so that we can properly count how many spiral arms there are in the Milky Way (4 plus some extra bits? ), whether some are thicker than others, and maybe even solve the mystery of how these clouds form in the first place. I have no idea. You might be here. But probably not. This particular galaxy looks more like a blobby spiral. 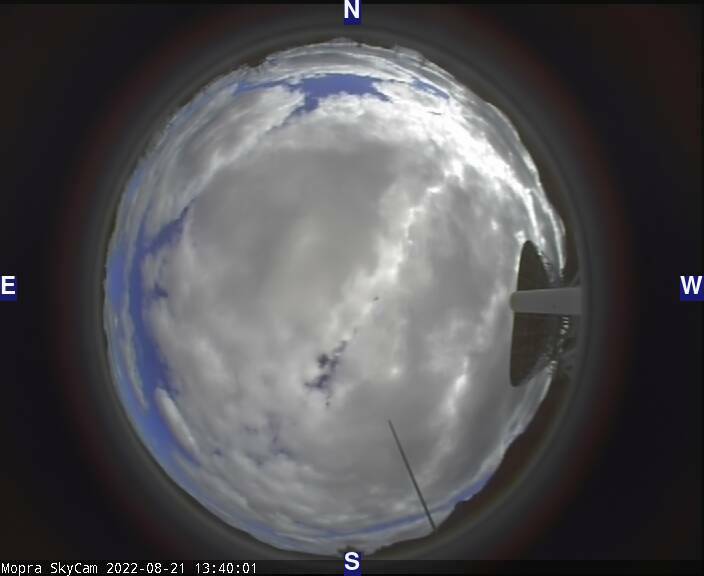 Next Post: Day 1 of Observing: Check the Sky!